Andrew Beckingham on his farm in Rutland. There were two Wars of the Roses battles in our neck of the woods. There was one on Bosworth Field that saw Richard III lose his crown… and the other one happened in Rutland. 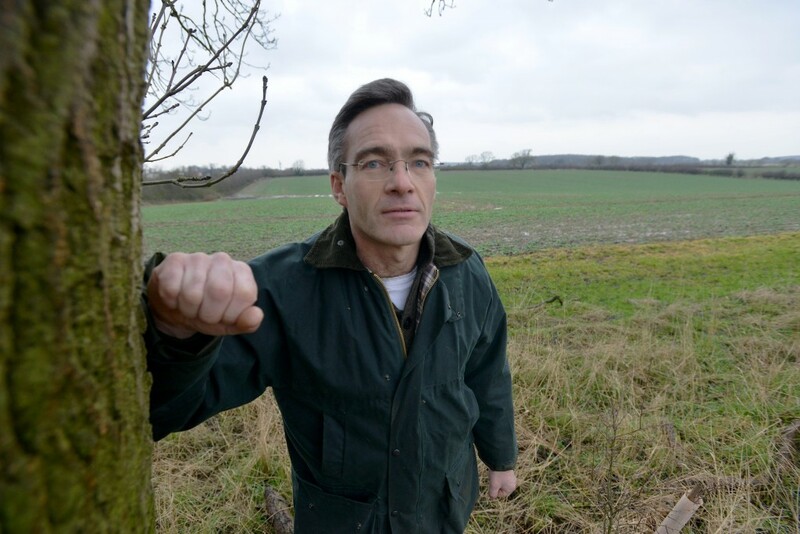 Farmer Andrew Beckingham has a battlefield in his back garden. Not that you’d know it. A few years ago, after a campaign by local history fans, the council put up a battle information board and hammered it into the verge in front of Tickencote Warren Farm. Soon after, it was obliterated by a hedgecutter or a car and didn’t get replaced. It all seems somehow indicative of the general attitude surrounding Rutland’s tiny dalliance in the Wars of the Roses – a battle which saw King Edward IV take on an army twice the size of his own and then, 45 minutes later, brush himself down, look to the horizon and continue on his way to Stamford. “Maybe I should put something up myself,” says Andrew, whose family has ploughed the land here for half a century. “There ought to be something there, really. I was pleased to see the council board, but it wasn’t there long before it was destroyed. Overlooked is putting it politely. Ask around and most people have never heard of it. When it comes to the Wars of the Roses’ local footprint, they don’t get bigger than Bosworth. Losecoat always loses out. Outside of Rutland, how little-known is the battle in England’s littlest county? Well, put it this way, says Rupert Matthews, a military historian and author, when he was tasked with writing a series of war books by his publisher, it was suggested he write one on a conflict no-one had ever heard of. It was a battle that began with Edward IV setting out from London to deal with unrest in the east. “There was rioting in Lincolnshire and he was going up there to knock heads together,” explains Rupert. And it was then, on March 12, 1470, amid the green sloping fields of small and beautifully-formed Rutland, that he saw a sight that would have stolen his breath. And it had nothing to do with the scenery. The first Edward IV knew about any battle was the heartbeat before it began, says Rupert. “It was at this point the penny dropped. Reports coming out of Lincoln had been mixed, clearly there was trouble. Some had reported it as anti-tax protests, that nobleman Robert Welles was somehow involved, but it wasn’t clear-cut. Warwick, was, in fact, building an army for his rebellion. Robert Welles was among his crew. “What had happened was the king had been lured out of London and into a more remote and vulnerable part of the country on false pretenses. It was then Edward may have noticed the livery jackets of the approaching army. The colours of Edward’s own brother, the Duke of Clarence, and his cousin, Richard Neville, the Earl of Warwick, AKA the Kingmaker. This was Edward IV they were dealing with. The founder of the York dynasty. The brother of Richard III. The numbers involved in the battle vary depending on who you speak to. Rupert believes the king had between 6,000 and 10,000 men. “It’s written that Welles had fewer soldiers but more men – 15,000 all told,” he adds. The armies gathered on opposing sides across the fields of Tickencote Warren. It was then that Lord Richard Welles, the father of Robert Welles, was marched out on to open ground in full view of the two factions. Weeks earlier he had been taken hostage by the king in an effort to bring Welles the younger to heel. Welles, meanwhile, had shown his dissatisfaction with regal government by beating up the Sheriff of Lincoln. On seeing that Welles junior really wasn’t going to play ball, the king took action. Welles senior was forced to kneel facing the opposing army and with a swish of a longsword, Lord Welles’s head was neatly liberated from his shoulders. The battle was now well and truly on. Crude cannonballs were fired from Edward’s ranks and his men charged. Some accounts suggest the rebels broke lines and fled as soon as the charge began. Whatever the case, 45 minutes later it was over. The losing side were seen fleeing the field across the ridge beyond and shedding their livery jackets as they ran. Hence the name of the battle – Losecoat Field. Those coats bore the treasonable colours of rebellion. If caught, the wearer guaranteed themselves a short and brutal death. The Earl of Warwick, meanwhile, had made it as far as Ashby when he learned the battle had been fought and lost in Rutland. He then made his escape abroad. He died a year later at The Battle of Barnet. The Duke of Clarence, Edward’s brother, was raising Warwick’s troops in the west country during the fighting. He also fled abroad and was later convicted of treason and, in 1478, according to Shakespeare, was executed by being drowned in a vat of malmsey, a sweet wine. Sir Robert Welles and his commander of foot, Richard Warren, were captured during the rout and were executed a week later, on March 19, 1470. As for the men who fought at Losecoat, Rupert puts the number of dead at between 500 and 600, half the number of those killed at Bosworth. At some stage during 1470, whether the day before the battle or some time following it, Edward IV had called in at Oakham, Rutland’s capital. At the castle, he left an enormous horseshoe, starting a tradition that continues to this day. As for Losecoat, says Rupert, it doesn’t leave much in the way of legacy. “The battle was over quite quickly and quite a good example of how a commander, given restrictions of medieval warfare, could succeed. “Its main importance was it was the start of the Warwick rebellion. Before then, Edward thought Warwick was completely loyal. “The reason it is overshadowed is because it was over within about 45 minutes. Nothing really changed because of it, unlike Bosworth. Thirdly, I suppose because there were no new tactics or new weapons. As for the artefacts of the battle – there aren’t any, although a nearby copse is known as the Bloody Oaks. There’s even contention about the name Losecoat Field. Etymologists argue this was once hlose-cot, which stands for pigsty cottage. Today, the land of the battlefield is a stone’s throw south east of Rutland County Golf Club and a mile or so from Empingham. When Rutland County Council was asked about its recognition of Losecoat, it issued a bland press quote. Which sums things up, really. As for Andrew Beckingham and the other proud Rutlanders who would like to see more done to commemorate this medieval conflict between a king and his own kin, their time awaits. So, Mr Beckingham, what’s it like having a battlefield as your back garden?